This post covers the types of account numbering formats that can be used to construct a chart of accounts, and also lists sample charts of accounts that use each of the formats. 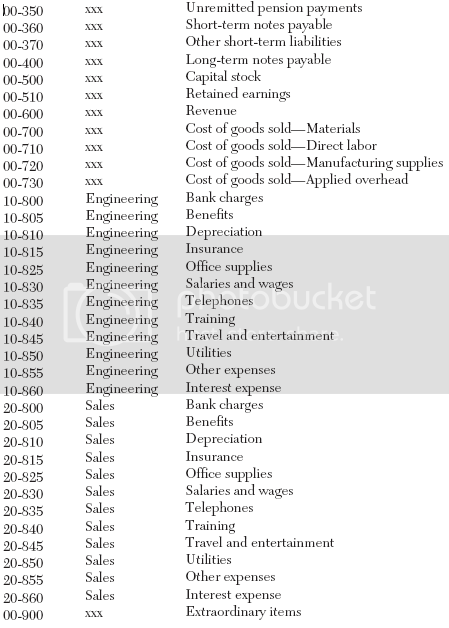 All of the charts of accounts shown follow the same general sequence of account coding, which itemizes the accounts in the balance sheet first, and the income statement second. A three-digit account code structure allows one to create a numerical sequence of accounts that contains up to 1,000 potential accounts. It is useful for small businesses that have no predefined departments or divisions that must be broken out separately. Notice how each clearly definable block of accounts begins with a different set of account numbers. 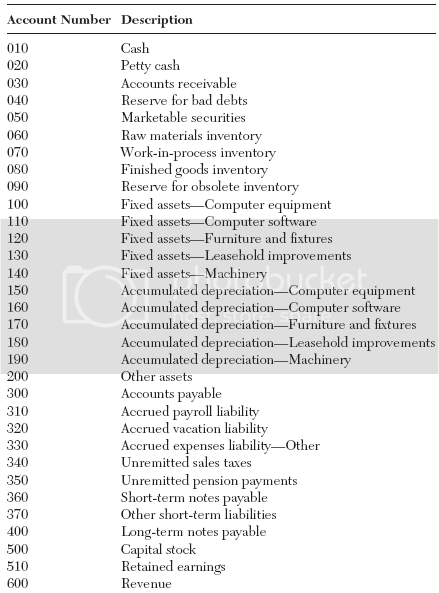 For example, current liabilities begin with “300,” revenues begin with “600,” and cost of goods sold items begin with “700.” This not only makes it easier to navigate through the chart of accounts, but is also mandated by many computerized accounting software packages. 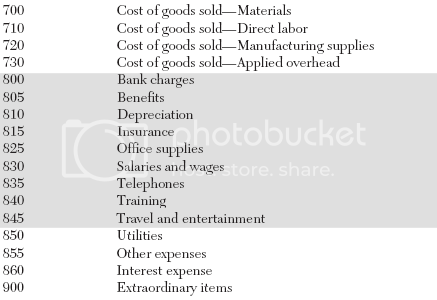 A five-digit account code structure is designed for those organizations with clearly defined departments, each of which is tracked with a separate income statement. 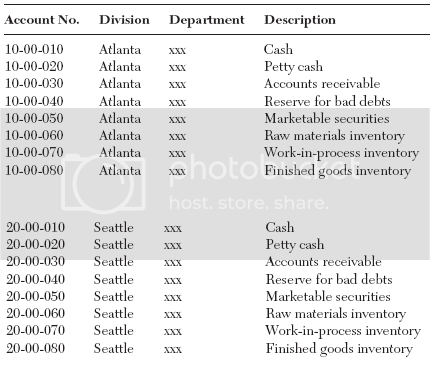 This format uses the same account codes for the balance sheet accounts that we just saw for three-digit account codes, but replicates at least the operating expenses for each department (and sometimes for the revenue accounts, too). 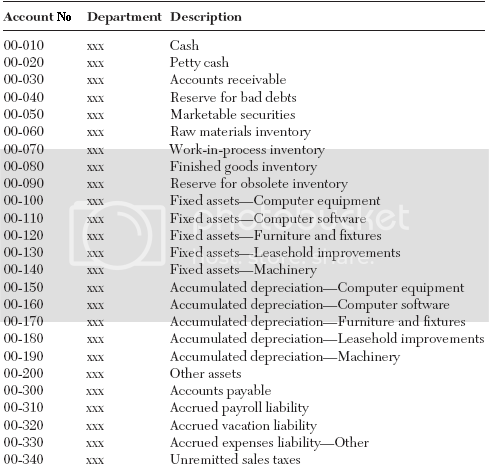 In this example, all expense accounts are replicated for every department. This does not mean, however, that all accounts must be used for every department. For example, it is most unlikely that bank charges will be ascribed to either the engineering or sales departments. Accordingly, those accounts that are not to be used can be rendered inactive in the accounting system so that they never appear in the general ledger. A seven-digit account code structure is used by those companies that not only have multiple departments, but also multiple divisions or locations, for each of which the management team wants to record separate accounting information. This requires the same coding structure used for the five-digit system, except that two digits are placed in front of the code to signify a different company division. These new digits also apply to balance sheet accounts, because most organizations will want to track assets and liabilities by division. 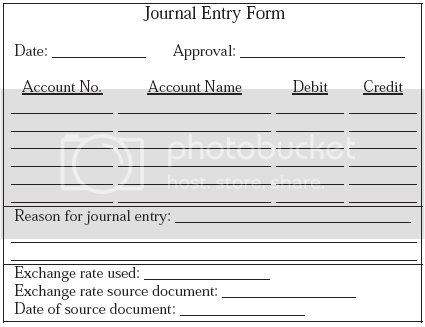 The form requires both an approval signature and description of the entry, thereby ensuring adequate documentation and evidence that the entry is necessary. There is also space at the bottom of the entry for references to additional exchange rate information, in case foreign exchange is involved.